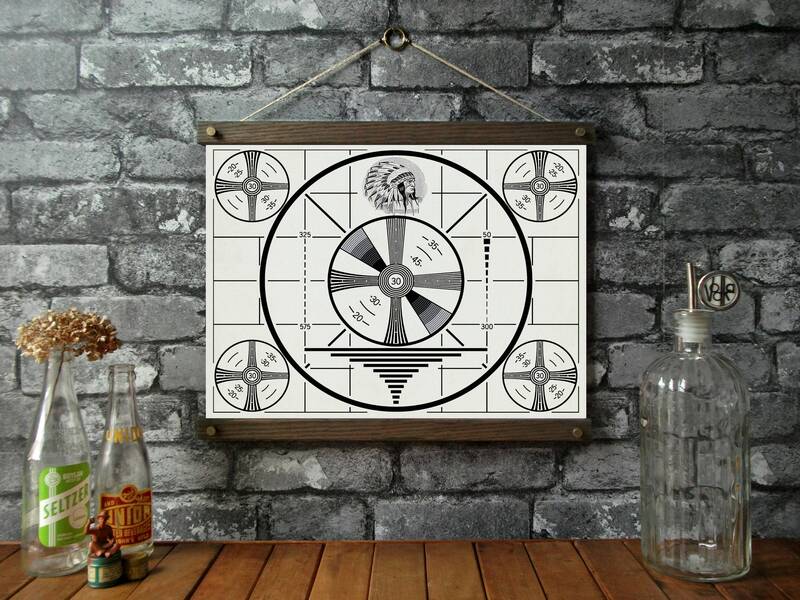 This chart features the test pattern known as The Indian Head Test Pattern which became familiar to TV audiences in America from 1947 onwards; it would often follow the formal television station sign-off after the United States national anthem. The Indian Head was also used in Canada, following the Canadian national anthem sign-off in the evening. The Indian Head test pattern could variously be seen: after sign-off but while the station was still transmitting; while transmitting prior to a typical 6 AM formal sign-on; or even during the daylight morning hours on newer low budget stations, which typically began their broadcast day with midday local programming around 10 or 11 AM. It was used until the late 1970's. + The 17" x 14" wide size is pictured in Old Oak finish hemp twine.